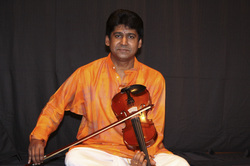 A well-known artist from South India, who has accompanied many leading musicians and has earned a reputation as a soloist. Sri Kothandapani hails from a family of musicians from Thiruvarur, the birth place of the Music Trinities. He had his musical training under his father Kalaimamani Thiruvarur Latchappa Pillai and continued his advanced training under the expert guidance of Shri. Sikkal Baskaran and Shri. Pakkal Ramadas, who is a disciple of Shri. Lalgudi G. Jayaraman. Sri. Kothandapani received his ‘Sangeetha Vidwan’ Diploma with a distinction and a Diploma in Music Teaching at Tamilnadu Govt. Music College, Madras. Sri. Kothandapani is the founder and director of Trinities School of Carnatic Music, which has many centres all over London, and the school currently has over two hundred pupils. He is the founder of Kala Ranjani, an organisation that promotes young musicians by providing opportunities for them to perform. He also conducts two Indian orchestras, ‘Nadha Manjari’ which has forty young musicians and ‘Rasika Ranjani’ a Junior Orchestra, both of whom have already given numerous performances to the delight of many music lovers. Sri. Kothandapani, a gifted and talented performer, a fine composer and also a brilliant Teacher, who has established himself as an outstanding musician through his dedication to Carnatic music. He is a very popular performer in the UK and Europe as both a soloist and accompanist at musical concerts.